Viewed by the naked eye from Earth, our Sun seems a reliable constant – an unblemished disk that makes its predictable entrance and exit from our sky every day. Taking a closer look, we see that, in fact, the Sun’s surface is in a constant state of activity, with significant variations in its surface. This activity is responsible for the approximately cyclic variation in our star’s luminous output, or more simply put, the amount of light the Sun emits. This cyclic variation is known as the solar cycle and can be readily observed in the variation in the number of dark spots, called ‘sunspots’, present on the Sun’s surface. Sunspots are manifestations of the magnetic activity on the Sun’s surface, and their quantity varies over a cycle with a period of around 11 years. But what’s the Sun’s magnetic activity about? We can think of the Sun as a giant magnet. In contrast to usual magnets that are in a solid state, the Sun is made of plasma – a hot fluid of moving magnetic charges. This makes it a peculiar fluid whose behavior is very different from fluids we usually observe on a daily basis, which are non-magnetic. It is difficult to observe the full activity of the Sun’s plasma, given that some of this activity takes place far underneath the surface, and there is much still we have to learn about this complex phenomenon. However, we do know that the movement of the plasma’s charged particles produces electric current, which generates magnetic field. The magnetic field lines are ‘frozen’ in plasma, which means that they follow the fluid’s movement, which can be quite chaotic. Hence, the magnetic field lines can adopt complex configurations, gather in concentrated ‘ropes’, or become twisted and tangled. The latter sometimes allow a buildup of energy, which, when released, produces spectacular and even dangerous phenomenon, known as solar flares. Another example is sunspots – large areas (with diameters of around 10,000 km) where magnetic fields are so intense that they block the transport of energy from within the Sun to its surface. This makes them appear darker than the rest of the Sun. Another important manifestation of surface magnetic activity contributes to the solar energetic output; they are called faculae. 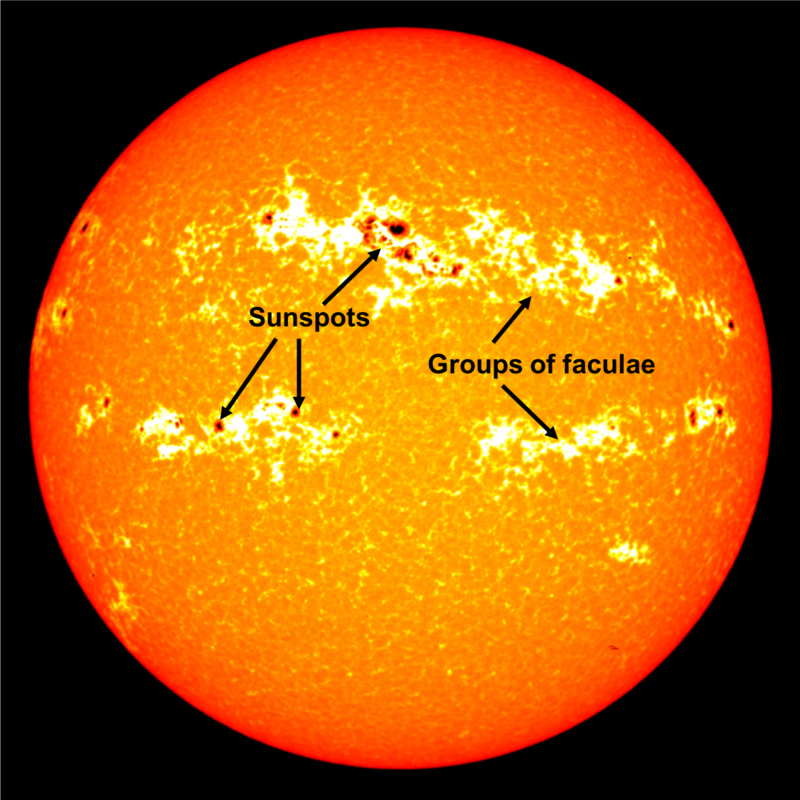 Similarly to sunspots, faculae are concentrations of magnetic field lines, but their diameter is much smaller – less than a few hundred kilometers. This difference in size produces a very important change. Instead of blocking energy, like sunspots, faculae transport energy more efficiently to the Sun’s surface. This results in faculae being brighter than the rest of the Sun’s surface. NASA/Goddard Space Flight Center Scientific Visualization Studio. Source data courtesy of HAO & NSO PSPT project team. HAO is a division of the National Center for Atmospheric Research which is supported by the National Science Foundation. Special thanks to Vanessa George (University of Colorado/LASP) and Randy Meisner (Michigan State University). This picture, featuring the Sun’s surface at a particular point in time, shows a tremendous number of bright faculae grouped around dark sunspots. Both faculae and sunspots are more numerous when the Sun is more active. In general, the faculae’s brightness is enough to overcompensate for the local darkening of the sunspots. Therefore, the Sun is brighter at maximum activity. All in all, this makes the total luminous power, as received at the top of Earth’s atmosphere, vary by 0.1% over the course of a cycle. This variation is very small. However, in some specific parts of the light spectrum, such as in the near- and mid-ultraviolet, the variation can be much larger (from 1 – 10% in the ultraviolet). As the (practically) only source of external energy of our planet, it’s logical to suppose that a variation in the Sun’s luminous output, even if very small, should have an impact on our climate. In fact, it is already well known that the variability in ultraviolet light emitted by the Sun has an important influence on the Earth’s upper and middle atmosphere’s chemistry (that is, above 10 km altitude), such as its impact on the ozone layer, which is found in the middle atmosphere. But what about the lower atmosphere, where our climate is defined? The effects of the Sun’s activities on the Earth’s lower atmosphere are much more difficult to highlight given their weak amplitude and the presence of other, much stronger natural variability (cyclones/anti-cyclones, El Nino/La Nina, etc.). However, more comprehensive models and more powerful computers allow scientists to simulate these effects with increasing accuracy. During the past decade, the solar cycle has shown clear signs of weakening, so much so that scientists started to speculate about the possibility of entering a new ‘grand solar minimum’ (Lockwood and co-authors, 2010). These periods of reduced magnetic activity, which typically last for a few decades, happen more or less periodically and are suspected to be responsible for some climate anomalies on Earth (Gray and co-authors, 2010), one of the most famous being the ‘Little Ice Age’ in Europe, whose coldest part coincided with the solar ‘Maunder Minimum’. 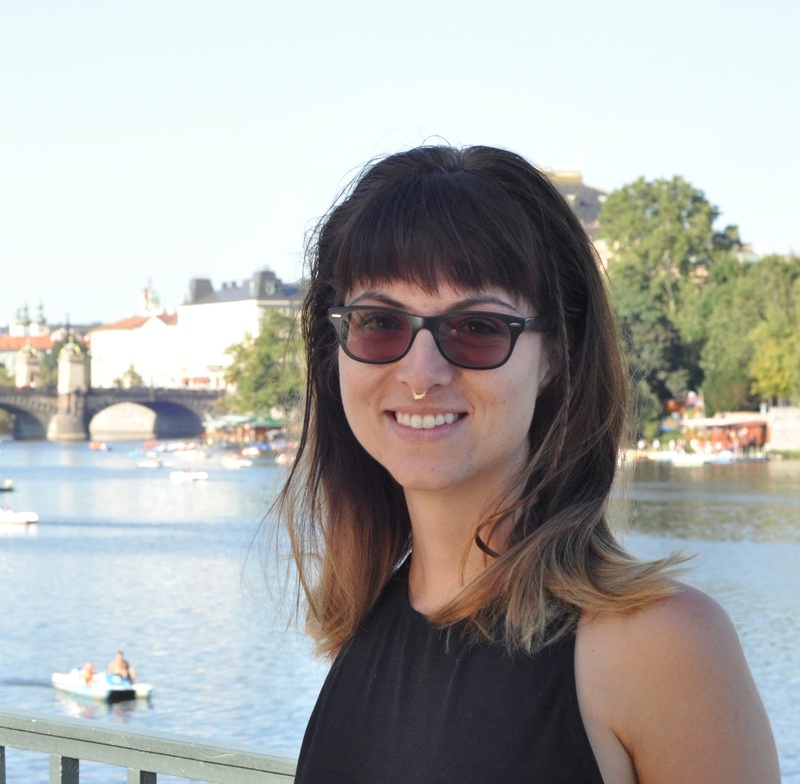 The authors of a study recently, Sarah Ineson and co-authors, explored the scenarios where a new prolonged solar minimum might cancel out the effect of human-induced climate change. Unfortunately, even in the most optimistic scenario, global warming would only be slowed down temporarily, and global mean temperatures would sharply rise again after the return of normal solar magnetic activity. Next PostNext What drives the South Asian monsoon?